Grains seeing a little strength overnight with beans up 6 ¼ cents, wheat up 3 ½ cents and corn up slightly ¾ of a cent. National corn harvest came in at 84% complete this week, up from 76% last week and 81% last year, but below the average trade estimate of 87%, and the 87% five-year average. Soybean harvest at 88% was up five points on the week, behind 91% estimated at 93% both LY and on average. Winter wheat planting and emergence remained behind their comparables at 89% and 77%, respectively, with condition ratings of that crop rebounding 3% this week (versus a steady estimate) to 54% g/ex, now even with last year but still behind the 58% five-year average rating for this week. Tomorrow afternoon’s October NOPA soybean crush is expected to come in at 170.0 million bushels, up from 160.8 mbu in September and 164.2 mbu last October. Yesterday’s weekly export inspections had U.S. wheat exports running 21% behind a year ago with the USDA currently forecasting a 14% increase on the year, and corn 86% ahead (unchanged). Weekly soybean inspections rose slightly this week to 47.8 million bushels, up from 45.7 mbu the week prior; inspections have come in in the 44-49 mbu range in each of the last five weeks, with that average of 46.3 mbu, compared to over 80 mbu during the comparable span last season. 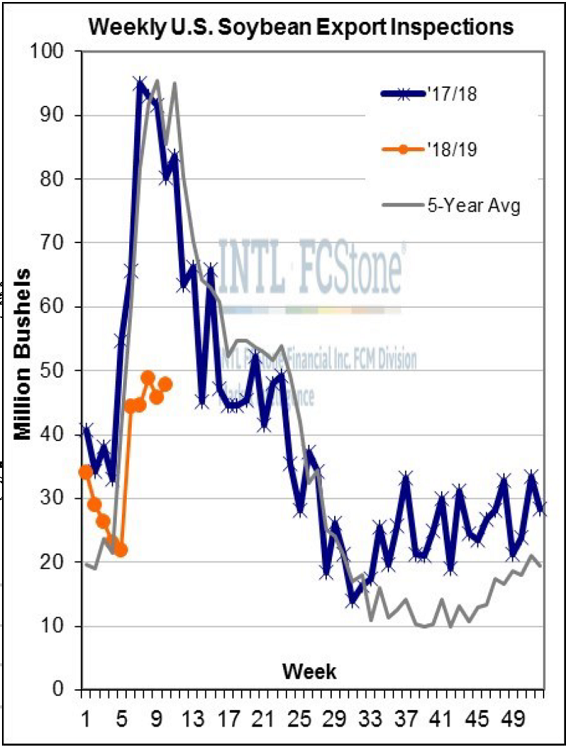 Cumulative inspections of 364 mbu, already 263 mbu behind last season’s pace through just the first ten weeks of the 2018/19 marketing year, with the USDA still only looking for a 229 mbu total year-over-year soybean export decline.